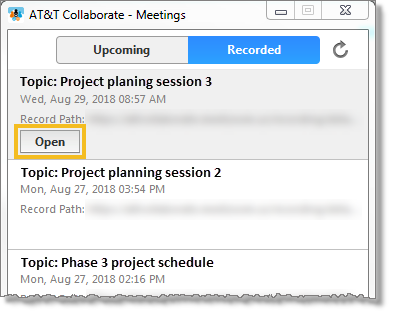 With the AT&T Collaborate – Meetings web and desktop applications, you can view all recorded meetings. At the top of the meetings page, click Recorded. All recorded meetings are listed with the most recent at the top. 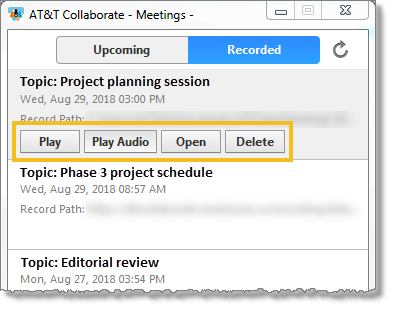 Hover over a recorded meeting, and then click Open. 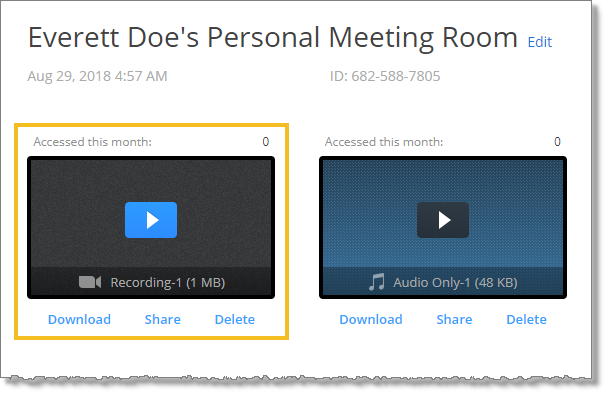 The web page opens that contains the cloud recording of your meetings. To play the recording, click the Play icon. To save the recording to your computer, click Download. To copy recording access information that you can paste into an email or text message, click Share. To delete the recording, click Delete. To play the meeting, including any video, click Play. To play an audio version of the meeting, click Play Audio. To go to the location on your computer where the MP4 file is saved, click Open. To delete the MP4 file, click Delete.